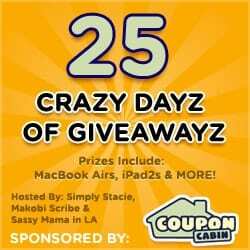 CouponCabin's 25 Crazy Dayz of Giveawayz Hop SIGN UP NOW! Sign ups are now open! Please fill out the form (and say that Just the Two of Us and Deals referred you!) and submit your administrative fee of $5 to SassyScorpYM@gmail.com We will email you within 24 hours to confirm your participation. Then please spread the word and tell others about this amazing hop and to say that YOU referred them! !